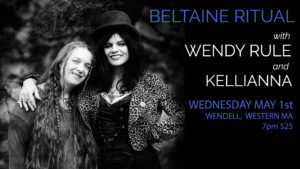 Celebrate the ancient Springtime festival of Beltaine with an intimate outdoor ritual hosted by renowned Pagan songstresses Wendy Rule and Kellianna. These two close friends and collaborators will guide the participants through a joyous ritual around an outdoor fire circle at the lovely woodland home of Kellianna in Western Massachusetts. If you have a drum, bring it along to help raise some energy! Only 25 tickets available.